RL Nunley, Rodmaker - Custom Bamboo Flyrods for the Discriminating Angler"
Thank You for your Service to our Country and our Community. We have now extended our 20% discount to other community servants including School Teachers, Court Officers, and Federal and State Government Employees. Would you like to Trade In your old Bamboo Rod? I take used or collectable bamboo rods as trade-in's on new rods. If you choose to trade a rod, it will be considered as a down payment, therefore I cannot refund money on trade in rods. If you have a rod you would like to trade, just call or email the details and pictures of the rod so rod's value can be determined. The Classic Series is absolutely one of the finest bamboo fly rods available. I use the same varnish and application method employed by the H. L. Leonard Rod company in their later years. This classic Spar Varnish finish has an appearance and appeal that I've never been able to find in Polyurethane finishes. The reel seat fillers are made with the customer's choice of woods. I stock everything from straight grained Walnut, Butternut and Spanish cedar to some of the most highly figured Maple, Amboyna and Thuya burls available. The handles are the finest quality cork available, or the customer, at no additional cost, can have a hardwood handle or a Rattan wrapped handle installed on their rod. Stunning doesn't come close to describing these rods and they cast as good as they look. The North Fork rod is a fantastic casting rod, but is only offered with a single tip and with limited appointments. It has has the same quality casting characteristics of all R L Nunley fly rods. This rod is available with a straight grained walnut reel seat and nickel silver hardware. Other than that, the customer has his choice of appointments and wrap colors on the North Fork. This rod is very appealing to the eye and a pleasure to cast. Now available in all standard lengths and line weights. The Mill Creek Rod, named after one of my favorite fishing spots in Paradise Valley, Montana, is a great casting impregnated rod. 3X3 node spacing, a matte finish and bright hardware, including chrome guides make this a very appealing rod. The rods have a Fine quality cork handle and choice of striped maple or walnut reel seats. Cane choices are natural color or flamed. Simple elegance best describes these rods. I am now taking orders for quads to be delivered in mid 2010. Many fly fishers enjoy the distinct casting characteristics of the 4 sided rods. Beautifully appointed with the same hardware and handle options as the Classic Series, the quad's are a fine fishing tool. Note: The North Fork rod is only available in 2 piece with a single tip. All other rods have 2 tips, at the customers option, and all tips will be mirrored. I offer Complete Restoration and Repair Services. Please call or email for prices on service, repairs or restorations not listed above. A $300 non-refundable deposit is required on all custom rod orders. An additional deposit may be required on special items, including, but not limited to tapers that I do not normally make, methods of construction that I do not normally employ or a special services, like engraving or personalizing hardware, custom build cases, etc. Deposit amounts on special orders will be determined on a case by case basis. Orders may be placed by email or by phone. I prefer to take orders by phone at the shop between 8AM and 4PM Central Time, Monday through Friday. This way, I will be at the shop and your rod order will be put immediately on a Order Card and placed on the Work Board. To place an order by phone, please call 479-414-6470. I keep very few rods in inventory other than demo rods and rarely will I have the rod you want in stock. Occasionally, I'll have a demo rod that was made for a show or display at a fly shop that can be purchased immediately, but that is the exception rather than the rule. Completion and delivery of your rod will be dependant upon my current backlog. When you order your custom rod, I will be able to tell give you an approximate delivery date. 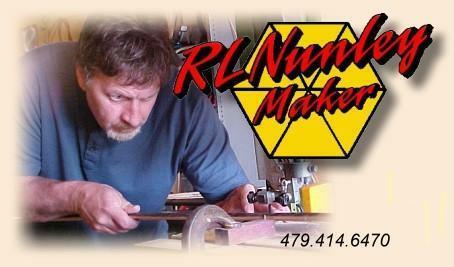 I am a FULL TIME rod maker, so I work in the shop daily to avoid backlog situations. When the rod is complete, I will send the customer an invoice and the balance due on the rod must be paid before the rod is shipped. All purchase are covered by my Warranty. Specially manufactured items, tools, rods and accessories will require a deposit. On such items the deposits are non-refundable. When a deposit is made on a rod or tool, bamboo, nickel silver, glue, shop supplies and other disposable and non-disposble parts and supplies are used to begin work on the order, therefore we cannot refund deposits, except under special or extreme circumstances, which will be considered on a case by case basis. If an order is made for an odd or unusual rod, fixture, tool, hardware, case or other item that we do not normally manufacture, then Deposits will not be eligible for refund. This includes, but is not limited to, unusual guide wraps colors (Colors that are not normal to an RL Nunley Rod), custom built tools, rods with unusual appointments (hardware not normally made by the RL Nunley Rod Company) and rods built on a taper that we do not normally produce. We warrant all rods, hardware, fixtures, fittings and tools against defects in materials or workmanship and will replace or repair any defective parts. We also warrant that RL Nunley rods shall not suffer damage under normal fishing use. The warranty shall not cover damage caused by obvious abuse. Any replacements, refunds or compensations, whether material or monetary, will only be made after the defective part, fitting, fixture, rod, tool or other custom ordered item has been returned to RL Nunley Custom Bamboo Fly Rod Shop in Mountain Home, AR. If you have any questions about other details of our warranty or return policy, contact us by email with your questions and we'll be happy to mail or email you a complete copy of our company warranty and policies.